Have I ever mentioned how much research goes into the paranormal? If you want to be a good paranormal investigator it deals with so much more than just “ghost hunting”. You need to know the history of the land, of the building, and sometimes of the object and/or the people. History can start to explain some of the haunts that are taking place. I love the paranormal, but I also love history. Now, I am not a historian, and I sometimes can lack in the research department; but I do love learning about the history and how things were. I was always one that loved things from the past; the styles, the objects, and especially the energy these objects held. I love going to museums and admiring these treasures from our history. So, you can only imagine how thrilled I was when a museum not only was able to offer me a history lesson and treasures to admire; but also some paranormal activity to go with it. Back in July 2015, I walked into the Museum of the Horse Solider in Trail Dust Town here in Tucson and as soon as I walked in the door I could feel the energy of the place and was greeted by the co-founder/director, Rae Whitley. Rae runs the museum and has such a passion for the history. Picture of the flag of the battle of Gettysburg. It has blood and gun powder residue on the flag! This place is dedicated to “preserve the history and heritage of our United States Military’s mounted services and recognize the horses’ contributions to U.S. Military history” and that it does. With so many original pieces, how could one not expect energy to be there? 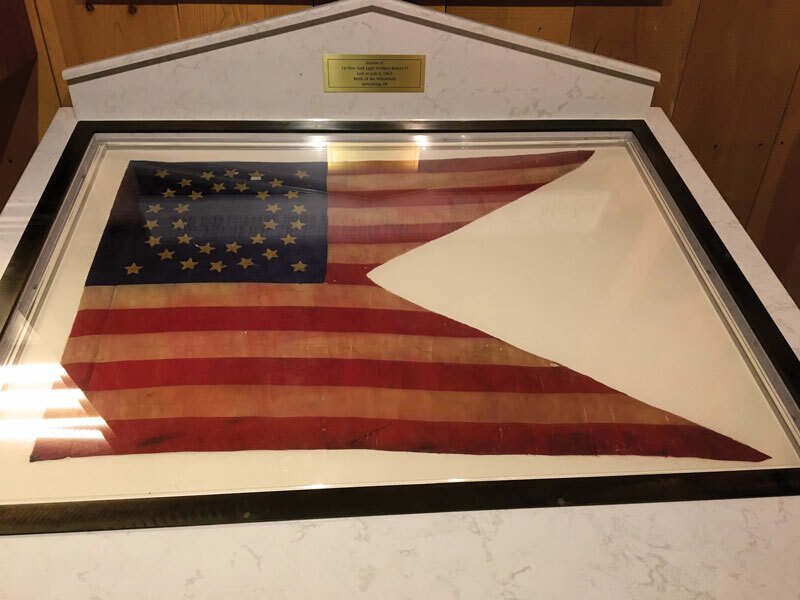 This museum holds the history of saddles, uniforms, and even has on display an original flag from the battle of Gettysburg. So much history and so much energy is being held in that museum, of course, not everyone is sensitive to these things, but I could feel it as soon as I walked in the door and to me, it was like being back in time. You can only imagine how thrilled I was when Rae agreed to allow my team into investigate. Now let me tell you a bit about this museum, it has floors that you cannot walk around quietly on and displays behind glass cases. During our investigation, we had some odd things happen, we did the flashlight test (where you ask the ghost to twist a flashlight on and off), and one came on when asking them to communicate, we heard weird sounds, I heard what sounded like taps on glass, and I know others have said they have heard footsteps when no one has been in the museum. We did receive some great EVPs of what we believe to be soldiers of course, but it was more than just them, we got what sounded like women and possibly even children. This museum has more than just military uniforms and horse saddles, it also has pieces of bullets, spoons, and other artifacts that were found in different military forts so who knows who these objects belonged to; which could explain the women and possible children’s voices. I have to say, I loved being locked in such a historical place for the night, doing what I love and I was not disappointed with the results. I was thrilled to even do a few public investigations at the museum back in October of 2015. The museum is being featured on my new driving tour and hopefully a new haunted history tour that I am putting together also. I can honestly say I can’t wait to share the history of not only the paranormal but the history itself and see what activity stirs up. You can visit the Museum of the Horse Solider Wednesday- Saturday from 11-7 or Sunday 11-5. Rae will give you all the history lessons you need and will do a wonderful job, just let him know Becky sent ya! Also, just keep in mind there is so much more behind that history and so many stories to be told; the dead do speak and this museum is honoring them in a wonderful way. Just remember when you go to visit this treasure that we are never truly alone!